There's very little to dislike about the Asus X53E-SX1330V. The glossy red chassis looks great, the Intel Core i7-2670QM processor is extremely capable and it's well-priced, at £750 (around $1,210) full price and as low as £540 (around $870) from some retailers. We can get tired of black and silver chassis designs, so a splash of colour is no bad thing. The Asus X53E is a deep shade of scarlet with a wave pattern on the lid made up of minute dots. Inside the laptop, the blank red is offset with the black isolation-style keyboard, and the result is a real head-turning design. There's also hardly any evidence of flex around the body of the laptop - even in the centre of the keyboard and around the DVD drive. The keyboard itself doesn't just look attractive, it's also functional and comfortable to type on. There's enough space between the keys, so it's unlikely you'll hit the wrong key by mistake. You're also given a dedicated numeric keypad for data entry and number crunching. There aren't any dedicated hotkeys, but the dual-function keys are clearly marked and easy to use. Above the keyboard is the Altec Lansing speaker grid. It's perfectly serviceable for the solo user watching a film or listening to music while working. If you want to use the Asus X53E-SX1330V as a media machine, there's 500GB of storage space to fill with music and movies and a screen capable of 720p high-definition footage. The screen, while not as bright as other machines, boasts a 1,366 x 768 pixel resolution and excellent viewing angles. Also, because the bezel surrounding the screen is particularly thin, it gives the impression you're looking at a screen larger than 15.6 inches in size. 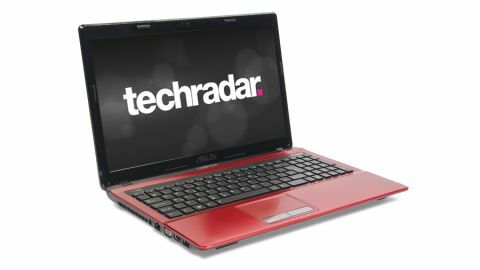 Interior power comes courtesy of a top-spec Intel Core i7-2670QM processor with integrated Intel HD Graphics 3000 GPU. You won't find enough graphical muscle here to play the latest games, but for other resource-hungry uses - such as editing high-definition home movies or programming your own website - these specifications are up to the task. The powerful processor and 4GB of RAM also mean that general day-to-day usage is a fast, smooth experience. You can multitask with several web pages open, while simultaneously playing music from iTunes and checking email with Microsoft Outlook, without the computer grinding to a halt. If you want to plug in a few accessories, there are a few ports to take advantage of. The Asus X53E-SX1330V is furnished with three USB ports, an HDMI and VGA port, as well as an Ethernet connection and the DVD RW optical drive. We would have liked to have seen a USB 3.0 port, but this configuration is standard for a laptop at this price. This laptop doesn't excel at battery life, though, posting only 197 minutes in our benchmarking tests, but, that's really one of the few drawbacks in evidence here. Overall, we can't help but recommend the Asus X53E-SX1330V as an excellent purchase. Its extra-powerful processor and impressive usability mean you can expect it to last at least for the next three years.